I've said it before, and I'll say it again: I love the idea of single hop beers. So here's Knee Deep's attempt at an "extra pale ale". OK, maybe it looks pale, but this is no pale ale. This beer is what most breweries call an I - P - A. Heard of that before? 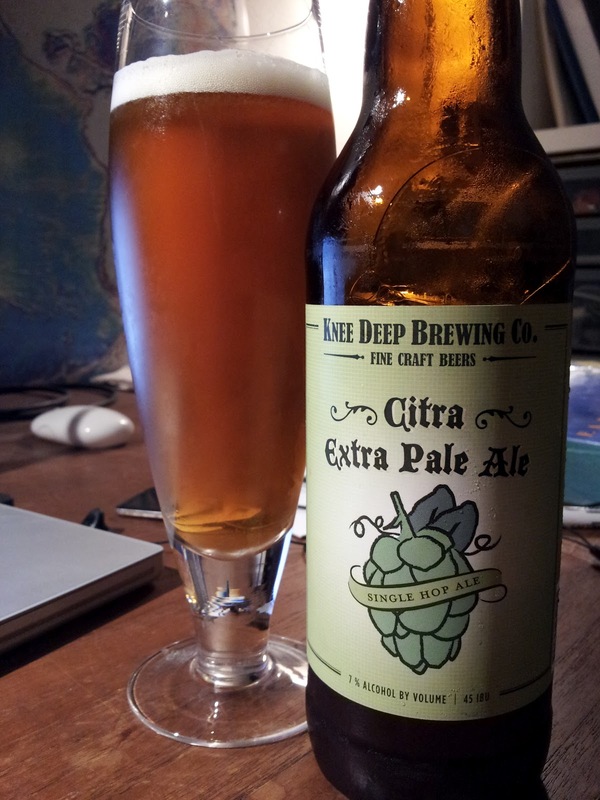 Seems to me our much lauded Knee Deep has a serious hop-identity crisis. This tastes strikingly bitter for 45 IBU (consider Big Eye is nearly 80 IBU), and clearly there's a deep malt backbone (it's 7 damn percent), but the bitterness is precisely why this succeeds. I noted in the Hermitage Citra post that this hop-varietal is great for aromatics; unfortunately, this beer is sorely lacking in that department. But I also noted that Hermitage's usage of the hop was unable to keep the maltiness in check. This beer, however, does that brilliantly. I taste a bit of smokiness too. Interesting. I think this is a fantastic beer that's inappropriately named. Fortunately the label is miles ahead of the Hoptologist, and screams "HOPPY REFRESHMENT HERE! ", so I'll just stash this away in the category of great IPAs, and keep on truckin'. And finally: Thank the great beer lord this didn't taste like Pamola XPA.